Dance Commentary by Heather Desaulniers: "Swan Lake"
I ended my 2009 review of San Francisco Ballet’s new Swan Lake, choreographed by Artistic Director Helgi Tomasson, with the following sentence – “every time this production is mounted, you should be there to see it.” To much delight, Swan Lake has finally returned to the SFB season line-up and I was fortunate to catch the classic story ballet two nights in a row on opening weekend. My closing sentiment remains accurate some seven years later – this Swan Lake is special and not-to-be missed. Many of my initial observations held true. Tomasson’s inclusion of a brief prologue provides important narrative continuity and plausibility. Jennifer Tipton’s lighting design amazed at every turn. And the theatrical acumen of this entire company continues to exceed expectations. The swan corps in Act II impressed in their stellar attention to detail and technique. With an entrance reminiscent of the ‘Kingdom of the Shades’ scene from La Bayadère, the lines, poses and extension heights were the picture of precision. The swan cygnet quartet (the same cast both nights) wowed, though at the second performance, one dancer was pushing the tempo a little bit. It was also a little surprising when one of their headpieces fell off on Saturday. These things happen, of course. But no one picked it up. It just laid there mid-stage until the curtain came down, breaking the illusion that had been so beautifully and carefully set up. Siegfried’s Act I solo is still a bit of a mystery for me. Narratively it makes sense – while contemplating his duty and responsibility, Siegfried embarks on an introspective, meditative dance. Tomasson’s choreography for that section is gorgeous and Tiit Helimets (opening night) and Davit Karapetyan (Saturday) both danced exquisitely. But the issue comes in the transition. The preceding scene is filled with joyful village camaraderie and then suddenly, things shift to total individual solitude. It’s almost feels like a connective link is missing. But there were also new discoveries and delightful surprises in store. Back in 2009, I had commented that Act I’s peasant dances and Act III’s national dances had their issues. Not so in the 2016 version of this Swan Lake. The dance of the aristocrats not only had a more cohesive flow, but the five couples (again, the same cast at both performances) were so joyful. And the men’s batterie sequence was breathtaking. Both pas de trois were lovely, though the Friday evening cast (Dores André, Taras Domitro and Sasha De Sola) stood out with the ‘up’ feel to their every movement. Supported pirouettes finished up in passé, rather than down on the floor; developpés continued to extend out into space past the point of the foot. Saturday’s cast (Koto Ishihara, Gennadi Nedvigin and Lauren Strongin) definitely accessed that up-ness, but for them, it happened part way into the variation. Though Nedvigin was absolutely sublime throughout; the height he obtains in every jump truly defying gravity. Act III still starts off a little slow, but the collection of divertissements has indeed undergone a significant transformation. While the choreography may be more or less the same, there is a freshness and vigor to these dances that feels new. Of the four, the Neapolitan Princess is my personal favorite, and Jahna Frantziskonis and Esteban Hernandez stole the show on Friday. Rebecca Rhodes shone both nights as the Czardas Princess, but had a particular pull on Saturday – simultaneously commanding and authentic. It was fascinating to experience different dancers in the title roles back-to-back, each so different, the result of individual craft and interpretation. Alexander Reneff-Olson (Friday) and Daniel Deivison-Oliveira (Saturday) were spellbinding as Von Rothbart, both towering with manipulation and tyranny. 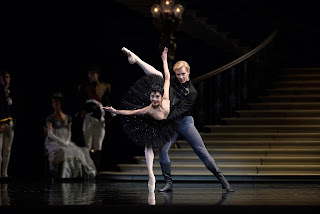 Yuan Yuan Tan took the audience on a brilliant technical journey as Odette/Odile on opening night while Maria Kochetkova’s Saturday interpretation revealed more of the narrative arc, especially when Odette and Siegfried meet in Act II. We saw the entire story – fear, uncertainty, fascination, infatuation and finally, trust – unfold in her approach to the role. Both Tan and Kochetkova excited as the black swan in Act III, though their portrayals were more mischievous vamp than evil seductress. And it is impossible to discuss Saturday night’s performance without special mention of the variations and coda in Act III – Karapetyan’s (Siegfried) solo was otherworldly and Kochetkova’s fouetté series was phenomenal. Almost every other fouetté turn ended with a double pirouette. At this year’s viewing, I also noticed how important the sissone step is to this ballet and how Tomasson has cleverly injected it into so many different choreographic sequences. The sissone is a jump that originates from a single point of articulation and then on the landing becomes two parts – one foot descends and then the other. One birthing two. What a perfect physical metaphor for the character of Odette/Odile. Bravo.